An elegant table arrangement for the grandest moment of one's life. Suitable for wedding décor, dining tables, reception and cocktail areas. 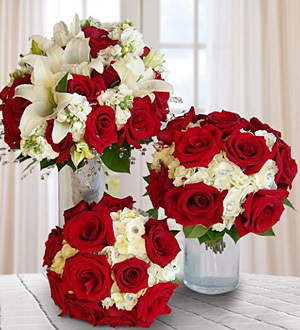 Tall Centre Piece comprises of 20 stalks of Red Roses, 4 stalks Casablanca, White Hydrangea 2 stalks and matching foliage in tall glass vase. Medium Piece - 20 stalks of Red Roses, White Hydrangeas 2 stalks in glass vase. Pomander Piece - 20 stalks Red Roses, White Hydrangeas 2 stalks and matching foliage.